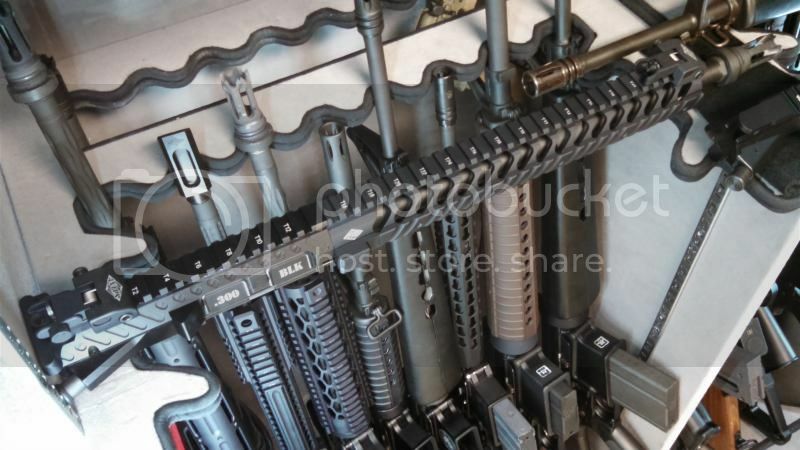 [ARCHIVED THREAD] - Marking your 300 AAC Blackout rifle? I know this is a terrible problem to have... How do you mark your different caliber AR15's to make them easily distinguishable in the safe? I'm specifically looking for the 300 AAC Blackout. Label maker. Black labels, white letters, one on each side of the upper. Same with Mags. I was wondering if the industry has identified or set a color marking for the 300, similar to how the British would mark their different cal Enfields in WWII, to distinguish between the 30-06 and the .303? My 300BLK is my SBR, so I can tell it from my other ARs pretty easily. I also use different style mags for the 300BLK to help keep things straight. 5.56 in PMAGs, 300BLK in Troy Battlemags. Found this... Some pretty good ideas. A gun rack... a gun rack. I don't even own *a* gun, let alone many guns that would necessitate an entire rack. Different color stock and grip. 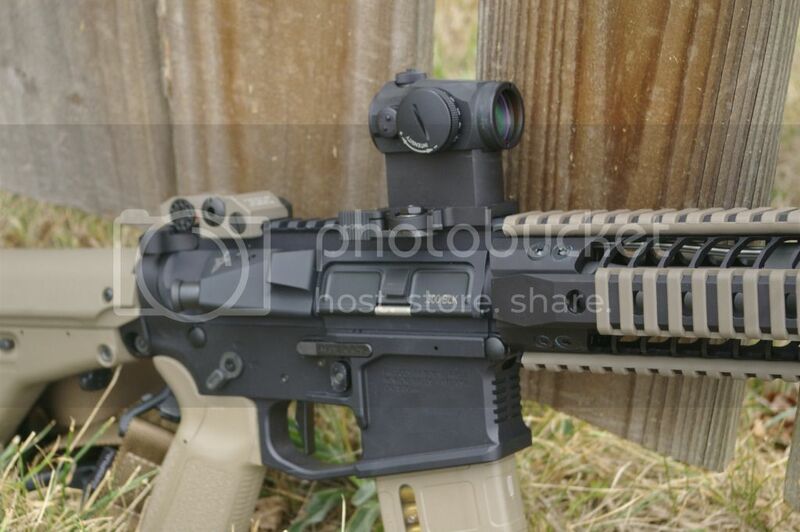 Wrap a piece of colored tape around stock or receiver extension or carry handle, or optic. Or a paint pen. Rail cover in a color. All of my ARs have different color furniture, so it's easy to tell what is what. I also only use Lancer mags for 300 blk and PMAGs for 5.56. This. I use green electrical tape and wrap the bottom of my 300 Blackout mags. Only 300 Blackout rounds go into those mags. If there's a chance of swapping mags or rounds, like when I take someone to the range, green electical tape gets temporarily wrapped around the magwell. If green/green, it's GTG. I also watch 'em like a hawk and before shooting 300 Blackout the 5.56 gear is removed from the bench and put into cases. This. You can find laser engraved dust covers all day on Amazon.i use the ones that are engraved on both sides so I can at a glance tell whether it's open or closed. I use a colored furinture system and a 300 blk marked dust cover. Some guys go to wristband.com and buy black wristbands with 300 blk on them and put them on their mags. 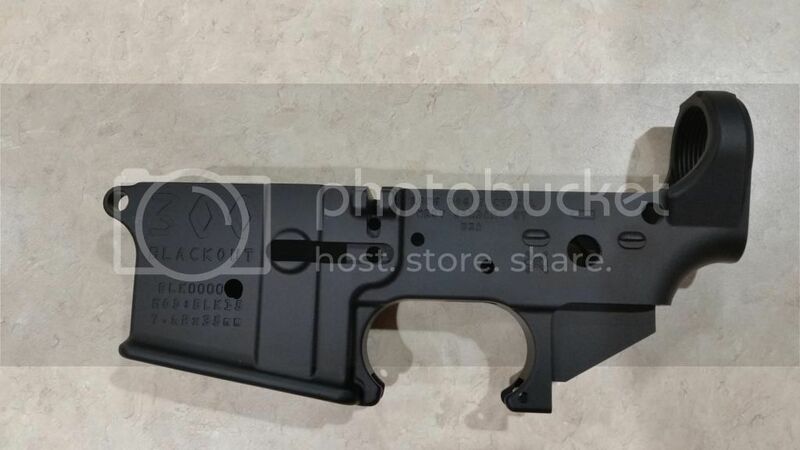 Tactical Machine has lowers in several calibers rather than just Multi or 223/5.56. 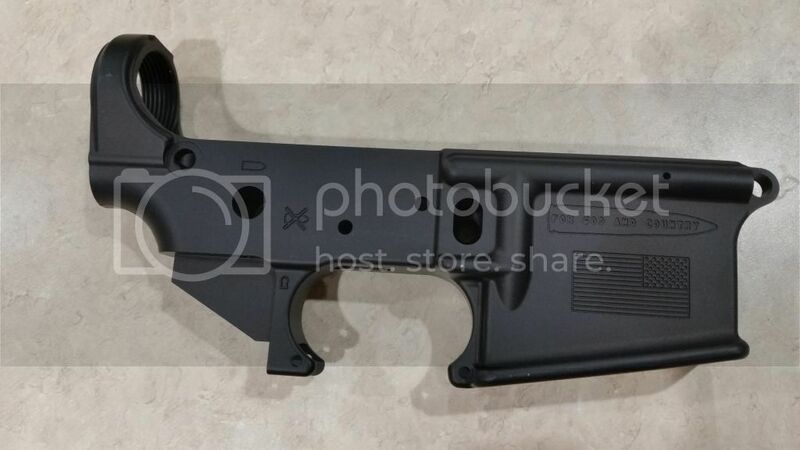 Have a 300blk from them set aside for a future build. I have also went the route of an engraved dust cover on a build I did that was chambered in .223rem. but the barrel was unmarked. I did not want to take the chance that I croak and it end up in the hands of someone pumping 5.56 out of it. It is a 24" bull barrel so it is pretty hard for me to mix up with the rest. My only (current) alternate calibers are .22LR and 9mm. I put white zipties on them (one on hand guard, and one on stock). The .22 has a thin, white zip tie, the 9mm has a thick white zip tie. I plan to build a 300 blackout and will Ceracote it to make it distinctive. I H8 NY,because I Love the Constitution. +1 this exactly, great minds lol. I like and use the engraved ejection port cover, both sides, for the uppers, and I use black magpuls for the 300BO, FDE, translucent or ODG for everything else, but I had not thought of the colored electrical tape or rubber band idea for the mags, so thanks for the ideas. For my rifles/uppers that aren't in 5.56mm, I use different color furniture. Except that some have rails, so in some cases it's rail covers. Except that my 300 Blackout "rifle" is a short upper, and has a lo-pro gas block under a free float rail and is the only 8" upper I have. Ejection port cover and different color of gun. I just pay attention to what I am doing. You can't always guarantee that for the other shooters who might be using your AR. And it has FDE furniture. The rest of my ARs are black except for one that is multicam and one daughter's pink rifle and another daughter's that is muddy girl camo. Some very good ideas presented. I'm still mulling over the options. I'm not sure of your background, but I've spent many years in an industry that isn't very forgiving of mistakes. Training, redundancy and application of effective methods help ensure effective outcomes. Job set up, technology and safeguards also mitigate disastrous mistakes. Mistakes happen all the time. Fatigue sets in, inadvertent shortcuts are taken and sometimes murphy's law, just happens. I've learned, though sad experience, that I want to control the variables I'm able to, whenever possible. To each is own. All of my AR's have laser engraved dust covers. There was a time I had AR's in five different calibers. In the event something we're to happen to me, I wanted to sure someone knew that they had in their hands. For some reason this brought me back to the show from the 80's called Sledgehammer. He would always say "Trust me I know what I am doing" then everything went south. Main for me is mags. Polymer mags have .300, metal mags are other calibers. I also have SOB combat bands on my .300 rifles.